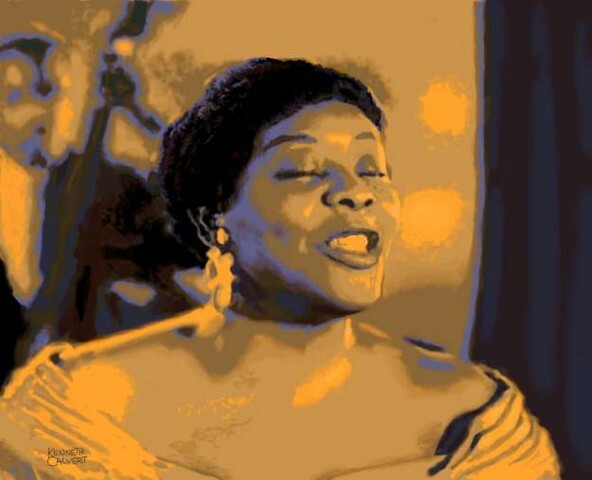 Dinah Washington, called "The Queen of the Blues” (August 29, 1924 – December 14, 1963), was an American Pianist, Blues, R&B, Gospel, Pop and Jazz singer. She has been cited as "the most popular black female recording artist of the '50s" and was inducted into the Rock and Roll Hall of Fame in 1993.In 1959, she had her first top ten pop hit, with a version of "What a Diff'rence a Day Makes". She followed it up with a version of Nat "King" Cole's "Unforgettable" and then two highly successful duets in 1960 with Brook Benton, "Baby (You've Got What It Takes)" and "A Rockin' Good Way (To Mess Around and Fall in Love)” Her last big hit was "September in the Rain" in 1961. Click on prints and access my Entertainment gallery for pricing and details.